Former Prime Minister Thaksin Shinawatra seems bound to return to Thailand. If he does, will it spark unrest? The return of former Prime Minister Thaksin Shinawatra to Thailand appears to be a formality at this point, a question of when, not if. It was probably inevitable as soon as the polls closed in Thailand’s general election in July, when Thaksin’s reincarnated Pheu Thai party, headed by his sister Yingluck, emerged victorious on a tidal wave of support from the country’s rural hinterland. Thaksin has been in self-imposed exile following his ouster in a coup in 2006. He was subsequently prosecuted and convicted of corruption and graft and given a two year prison sentence. But this past December, Thai Foreign Minister Surapong Tovichakchaikul announced that he planned to issue a new passport for Thaksin. Such a move would allow the former head of government and telecommunications billionaire to return home and, in all likelihood, for him to see his prison sentence commuted by his sister. The consequences of such a political power play could be significant. Thailand’s political system has been defined by coups and, more recently, protests, since the country’s transition to constitutional monarchy. 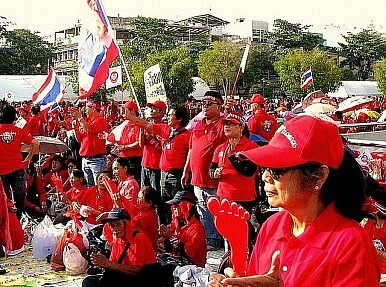 Thaksin’s ouster touched off a series of events that saw both supporters and opponents filling the streets at different times. Airports were shut down, the tourism industry was crippled, and more than 100 people were killed in violent clashes with the state’s security services. Will Thaksin’s return spur similar events? The pro-monarch Yellow Shirts, members of the Bangkok elite, were trounced in the elections last summer, but have consistently proven that they are well-organized and willing to come out and demonstrate against pro-Thaksin forces. The opposition Democrat Party, for its part, has already called for Yingluck’s impeachment over the matter of her brother’s passport. And the first six months in office have hardly been smooth sailing for Thailand’s first female premier. There was of course her bungled response to the devastating floods to hit the region in the autumn. And now the Democrats, recovering from their heavy electoral losses, are finding an old issue to rally behind in an attempt to sandbag Yingluck’s young government. Thaksin remains a lightning rod for controversy in Thailand, and this looming showdown between opposing forces will be sure to make for significant drama in Thailand in the months to come.